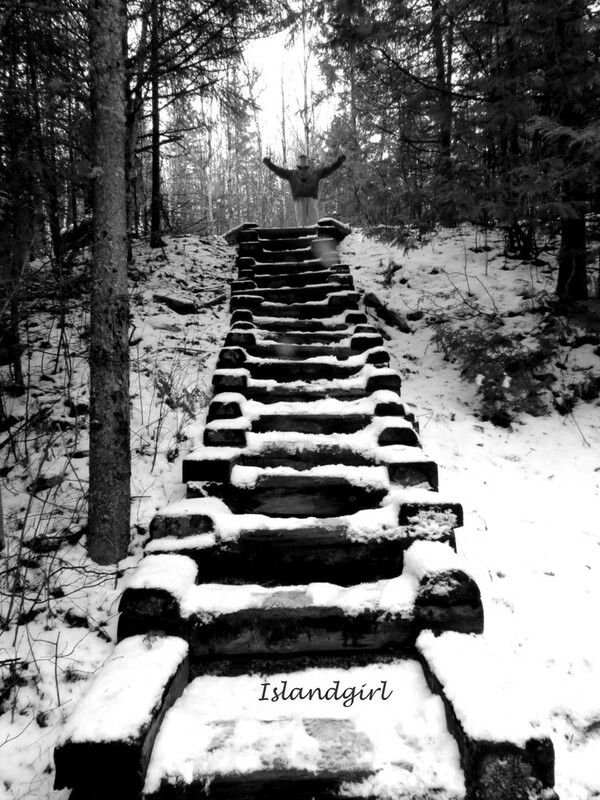 These stairs are located on our local nature trail which runs along side one of our many rivers. These stairs help you get closer to the river. I asked my hubby to pose for me at the top of the stairs, he is so accommodating!! Thank you for your comments and favs, always appreciated. Great POV and leading lines! I love the snow! Great pose! Great shot. Perfect for b&w. great leading lines, cool pose. is the river at the top, or bottom? My guess would be bottom. I love your title. Great shot and works great in B&W. It looks really cold there. Great POV! and kudos to hubby for going up those stairs to pose for you. Great b&w - those stairs make super leading lines. Like the light/dark patterning. Such a sweet helpful husband! Super shot and all the more so when presented in B&W. The boldness of the steps and the victorious climber at the top draw the eyes right into and up through the picture. wonderful composition and POV... and nice hubby! OH wow!!! Amazing pov and perspective. You didn't go out on the water? Ice? did you? Does it freeze solid? So beautiful! Looks like a steep climb from this viewpoint- but I'm sure it's worth every step for the view! Good shot! Wonderful shot! Love his pose! Great composition! Love this in B&W! Neat composition and of course a lovely subject t the top of the stairs! A wonderful staircase up to a welcoming person. Great composition! A bit slippy going up there I shouldn't wonder... he obviously loves you! @eyesmile hi Gena thank you for your comment, this fast flowing river will completely freeze over in a few weeks time however because the water is flowing underneath you cannot go onto it. @bill_fe Bill thank you for the comment actually the river is at both levels because of the falls. Good question. @milaniet thank you Milanie for your comment, you just made my husbands day! Fab capture. The b&w brings out all the details. Wish my wife was like your hubby. The husband makes the shot, I think. Those stair look somewhat dangerous right now. Great lines! He looks happy to be at the top! :) ! Stands to run up and down but I don't think it would work in this weather too slippery wonderful capture though. Love the pose! Great pov! A beautiful staircase, especially in the snow. These look fantastic in the snow!